This is a question posed by former Executive Director of the Sierra Club, Carl Pope, who challenges us to consider how autonomous vehicles should integrate into our cities. The difference between the car and the freeway is the perfect analogy as modernisation of transportation systems is a challenge we’ve faced, respectively, in recent history. Upon the invention of the motor vehicle, cities adapted through the formation of suburbs, yet it was the creation of freeways that cut through our cities and left urban scars. With the promise in the future of autonomous vehicles, we are faced with the possibility that they can restore balance to cities, or as Pope describes achieve “an era of urban flourishing that will be unprecedented in human history”. To further understand how this is possible, The Urban Developer sat down with Alina Dini, Associate Director at Verdia who is co-authoured Australia’s first on electric vehicle policy in Queensland and researched market barriers for clean technology adoption. Dini was able to guide us through how electric vehicles (EVs) and autonomous vehicles (AVs) can positively affect our cities of the future. EVs are still fairly uncommon in Australia, yet major cities such as Paris, San Francisco, London and Stockholm have increasing EV adoption. By 2020, China alone aims to increase their stocks to around 12 million units. In fact, where EVs have received strong support from Government, such as in Oslo, the “EV Capital of the world” 27% of new passenger car purchases are electric. According to the Australian Bureau of Statistics, Australians buy on average approximately 97,000 vehicles per month. However in 2016, they only purchased 219 electric vehicles for the entire year. If Australians bought the same percentage of EVs as Oslo, there would be 26,000 EVs on Australian roads every month rather than petrol cars. There has been much discussion about the impact of AVs on our cities, but the question remains: when? 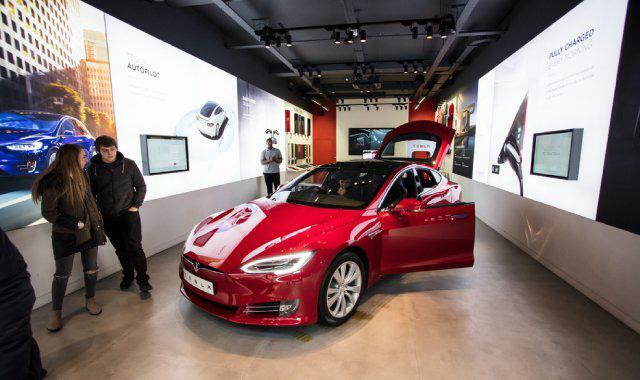 Tesla founder Elon Musk predicts that AVs will be on the road by 2023, while Institute of Electrical and Electronics Engineers (IEEE) predict that by 2040, 75% of vehicles will be completely autonomous. By 2018, Singaporean based NuTonomy aims to have a completely self-driverless taxi service which will expand to 10 cities by 2020. By 2020, Audi, BMW, Toyota, Ford, GM, Nissan and Google all claim they’ll have an autonomous range. By 2025, autonomous vehicles will be in use worldwide according to the US Secretary of Transportation. By 2030, Uber’s fleet aims to be completely driverless. In Australia, the Commonwealth recently announced $55 million of funding over 10 years toward a project called iMove. 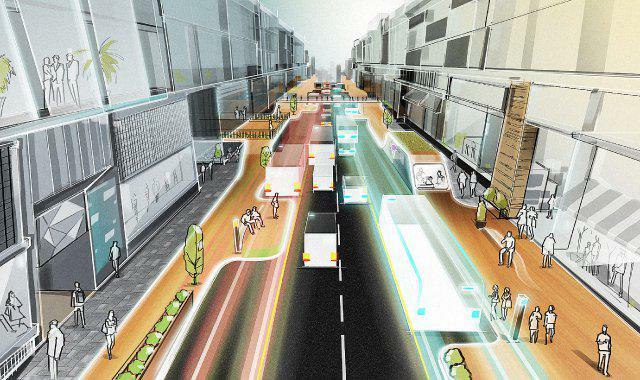 While iMove isn’t alone about connected, autonomous vehicles, it shines a light on the trend toward overlaying existing city transport infrastructure with intelligent transport solutions. What Impacts Can We Expect As We Transition From Petrol To Electric To Completely Autonomous. While the attributes of pure EVs are enough to wet the palate of city planners grappling with urban air pollution, congestion and traffic noise, connected autonomous electric vehicles can do so much more. Reduced parking requirements due to the improved efficiency of cars already on the road. Returning The Street Back To The People; Increased Efficiency In Traffic Flow, Including Reduced Congestion. Traffic flow and reduced congestion plays a far bigger planning role than we may give credit for. If traffic is moving more efficiently and in a controlled manner this will then allow for streets to be narrowed and streetscapes to be widened. Experts anticipate this will be achieved through data kept on each vehicle and the distances in which they can travel from one another. Effectively by monitoring this, traffic lights and street conditions can be adapted to suit. Through transport efficiency several opportunities are presented such as retail spaces being extended, pedestrian walkways improved and more bicycle lanes implemented. This will in turn create better user experience between people and cities. Less Carparks Equals Alternative Opportunities; Reduced Parking Requirements Due To The Improved Efficiency Of Cars Already On The Road. 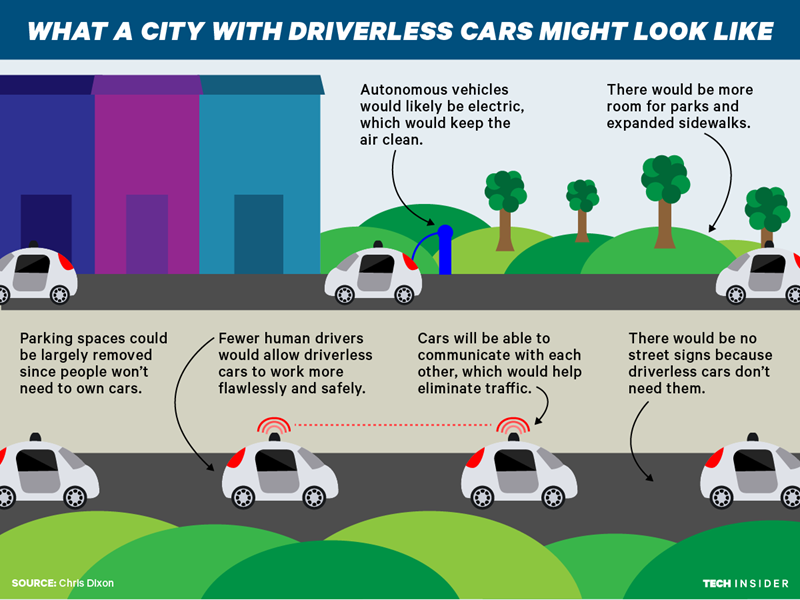 In a study published by Transportation researchers in 2016, it was suggested that connected autonomous electric vehicles could replace up to 6.8 privately owned vehicles, freeing up inner city car parks with housing, parklands or new commercials spaces. A key contributor to this becoming a reality is the implementation of car sharing. Given the nature of autonomous vehicles people will become encouraged to share vehicles as opposed to owning them. The ramifications of this will have huge implications on the city of the future at both a micro and macro level: from the design of individual developments to the planning of cities. At a greater city level the need for car parking will become substantially reduced. This may contribute to reductions in kerbside parking and the widening of pedestrian walkways. Car parking facilities may also become significantly lessened, which will then open new development opportunities to land currently occupied by carparking, service centres and mechanics. At a residential level, vehicle sharing and lower ownership means a requirement for less car parking. This will present an opportunity for greater gross floor area (GFA) dedicated to liveable space potentially boosting housing affordability. EVs Are The First Step To AVs, Three Reasons Why Their Environmental Effects Will Allow Our Urban Landscapes To Flourish. Pure battery EVs use no petrol. They have no engines, no tailpipes and therefore emit no exhaust. Whilst this will cause mass disruption to the petroleum industry, it opens up new commercial opportunities for cities and means zero emissions and cleaner, healthier air for all. Every additional conventional car on the road contributes to the diminished air quality Australians experience, especially when traveling in and out of our capital cities, with the passenger transport sector accounting for 62 percent of Australia’s transport emissions. Yes, you can power your EV entirely without electricity from the grid. This means that if you use renewable energy, your car can run on 100% clean energy. Their market development is synergistic – not just because it makes sense to pair clean cars with clean energy, but because cars are mostly parked during the day, when the sun is shining. This means, for example, EVs driven to work from home can plug into the grid during the day and absorb excess solar energy and use it for later via a concept called dynamic charging. From an infrastructure perspective this would result in the need for less service stations that offer charging, which opens up parcels of land within cities to new development. All cars, including electric vehicles are parked 95% of the time. What’s brilliant about this is that means that in a perfect world, EVs can recharge using intermittently generated renewable energy. 3. Electric Mass Public Transport. Light rail, electric buses (and potentially even hyperloops) are now providing us the framework for quicker, cleaner and more efficient ways of mass transport. This trend will also extend in the near future to the aviation and nautical industries. According to Ryan Popple, CEO of Proterra, a leading US electric bus provider, electric buses are now cheaper than diesel and compressed natural gas, and within 10 years, will dominate the bus market. Proterra’s commercial strategy is consistent with the claims, with a number of contracts won to deliver buses to cities across the US including $55 million to put 73 buses into metro Seattle. Similarly, Chinese manufacturer BYD has sold 40 buses to Sydney Airport Transport provider, Carbridge. It is anticipated that the first six vehicles in this fleet will reduce carbon emissions by 160 tonnes – as well as reducing noise pollution. What makes electric buses appealing to transit operators? Bus operators and patrons alike them because they are clean and quiet. City planners like them because they have set routes which enables easy recharging. And financial controllers like them because their use of electricity as a fuel (rather than petrol) is more cost effective and less volatile. And the greater effect of them to our environment is evident with the US Department of Transportation indicating that one electric bus is equivalent to removing 27 conventional cars from the road (equivalent to 1,690 tonnes of Co2). Alina Dini is Associate Director of Project Advisory at independent energy expert firm, Verdia. Alina works with clients to improve their sustainability and their bottom line. Alina’s international energy sector experience includes driving growth at Tesla; while on the academic side, she co-authored Australia’s first electric vehicle policy and researched market barriers for clean technology for her PhD.